We live in a world in which consumers expect more. Not just more service, but more personal engagement with the companies they do business with. When they Tweet about a problem to a company, they expect a response. When a company offers a guarantee, consumers expect companies to honor that. In return, consumers are loyal and refer their friends and family to the business. However, developing trust is more than just responding to social media and offering great customer service. Here are tips to building trust with your clients and customers. Be genuine. Trying to be or act a certain way with thwart efforts to endear consumers. It’s like the telemarketer who starts the call asking how you are or how the weather is where you live. You know they don’t care, they’re just trying to soften you up for the sale. Being genuine requires authenticity and sincerity that should flow naturally. Do what you say. When consumers trust you, they believe what you say and in what you offer. Consumers will enter into a business relationship with you hoping you’ll deliver, but trust isn’t built until you actually follow through. Be consistent. Consumers have an expectation about your business based on past experiences. 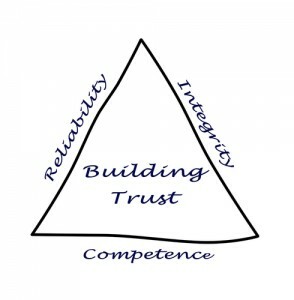 When you consistently deliver a quality product or service when you say you will, trust builds. Admit to and rectify mistakes. Life isn’t perfect. Even when you’re doing your best, things go wrong. Technology fails. The package is lost. It’s easy to blame outside forces when things go wrong, but all the client or customer cares about is that he didn’t get what you said you’d deliver. If the mistake is on you, admit it and work to rectify it. If the problem occurred outside your control, you still want to make the situation right. When a consumer knows you understand his frustration and will work to remedy the situation, trust rebuilds. Especially today, people are skeptical. They’re not going to give their trust blindly. Instead, trust is built by giving the very best you can. In return, customer and clients who trust you will be loyal to your business and refer new customers, making them a valuable asset in your business.